How Many New Year’s Resolutions Have You Broken So Far? I have never ever believed in making New Year’s resolutions mainly because if I wanted to stop doing something, give up something, or generally be a better member of society waiting until the New Year came around seemed to be pointless because it only comes around once every year. Mind you if you really don’t want to give up something, modify your behaviour or do whatever it is that a New Year’s resolution would make you do then the once a year thing works just fine, but maybe people who find it difficult working to such short deadlines should start to make resolutions on February 29th I have a feeling that “Leap Year Resolutions” would be best for them. Obviously the main advantage of “Leap Year Resolutions” is that you have plenty of time to plan just how you are going to keep them and of course if you really enjoy what you are about to give up then you have plenty of time to enjoy it right up until the deadline. Actually don’t you think that it’s odd that the things we really like doing like eating Chocolate, drinking red wine and so on are the subjects of New Year’s and in the future Leap Year’s Resolutions? Why is it that we should give up the things we like and vow to take up jogging or visit the Gym more often? Beats me! But then that might be a subject for another blog. All of which bring me round nicely to the title of this blog ‘how many New Year’s Resolutions have you broken so far?’ And indeed offers a new question – how many of the things that you decided to do/give up in your New Year’s Resolutions were things that you didn’t want to stop doing or of course not start in the first place – such as more trips to the Gym etc? I don’t think that we should not look after ourselves but let’s face it who among us are as mad as Jane Fonda and want to exercise for most of the day and still have to get our publicity shots headily Photoshopped. Not me but then my face is covered in a dense layer of fur which hides any wrinkles I might have, not that I am saying I have any, so I have an advantage over most of my readers here who would be, if they were like little old me, at the electrolysis clinic for hours on end everyday. Being a Cat has so many advantages doesn’t it? 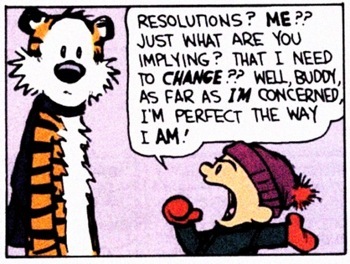 As the cartoon below shows you have to ask yourself a lot of difficult questions about any New Year’s Resolutions which you may be considering and if you are like Mary Poppins and though in a less icky way like me ‘practically perfect in every way’ then why should you be even thinking of making any New Year’s Resolutions in the first place? I think if you want to wear a hair shirt and make a New Year’s Resolutions to give up something or change something about yourself just because you think others might expect it of you, you should stop thinking like that immediately and do something really useful that will make an impact, send me the money you would save by not doing what ever it is you were doing and I promise to enjoy every cent, even after I have bought a Motor Yacht that is six inches bigger than Steven Spielberg’s. There I hope that makes you all feel much better because it isn’t such a bad thing to have little or no will power, let’s face it it is what most if not all of the institutions around the world today rely on, us being so easy to manage and guilt ridden to say nothing of hoping our attention spans are the same as Goldfish – here I am mainly thinking about banks and bankers. Happily that lack of will power and short attention span is not an affliction that affects Cats in any way whatsoever it is so great to be a Cat and so much better to be The Cat who writes blogs. Previous PostI Like Shellfish But Not This ShellfishNext PostGood News If You Ever Run Out Of Ladies!